Update: In March 2019, Tableau Foundation committed over $1.3 million in software, services, and financial support to help eliminate veteran and chronic homelessness in 50 communities across the U.S. by 2025. The partnership will help Community Solutions, a nonprofit expanding the use of data and analytics for its highly successful Built for Zero program. This grant helps all Built for Zero communities move from working with aggregate-level data to person-level data, while also helping automate the process of ingesting, transforming, and visualizing their data. Tableau Foundation has been working with the Built for Zero team on ways to bring together data from dozens of organizations across a community and help people in need get the right support in the moments they need it. To date, 10 communities – like Arlington, VA, Bergen County, NJ, and Abilene, TX – have functionally ended homelessness for veterans, people experiencing chronic homelessness or both. The initiative has exceeded its initial 50 communities and is now active in more than 70 communities across the country including Detroit, Phoenix, Jacksonville, St. Louis, and Denver. Read more about the initiative on Fast Company. Homelessness isn’t just a housing issue. Or a public health issue. Or a policy issue. It’s also a data issue. Data informs how communities distribute their limited resources among the people who need help. And local leaders need current, accurate data to shape action plans and tackle the issue head-on. 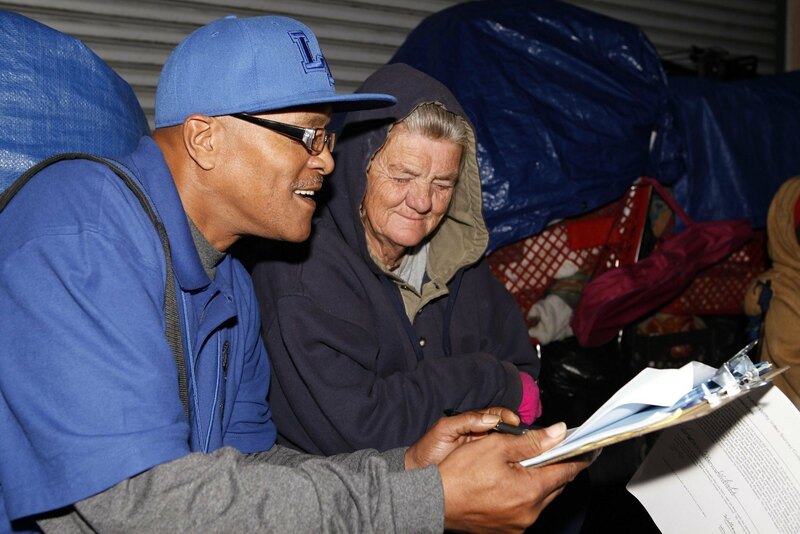 Community Solutions is a non-profit organization with a mission to end homelessness and the conditions that create it. In 2015, Community Solutions launched the Built for Zero initiative, a national effort of more than 70 communities across the country who are committed to ending homelessness, starting with veterans and people experiencing chronic homelessness. 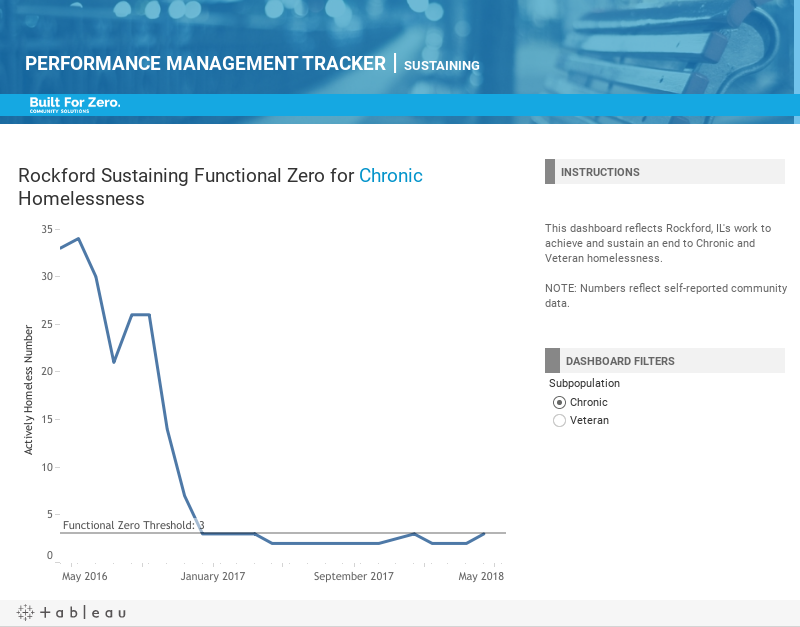 Built for Zero communities collect real-time data on people experiencing homelessness in order to optimize local housing resources, track progress against monthly goals, and accelerate the spread of proven strategies. We’re thrilled to partner with Tableau Foundation to give our Built for Zero communities access to industry-leading data analytics software to help inform their work towards ending homelessness. Until recently, most cities had little information about their neighbors experiencing homelessness, relying on annual census data and using this figure to inform decision-making long after. We found that outdated data was limiting communities’ abilities to address homelessness with the skill and precision needed to end it. Instead of collecting data once a year, we created a comprehensive account of every person experiencing homelessness at a given time in a community. We call this data set the by-name list. Our data team worked with communities and partners to develop a clear, measurable standard for real-time data and tested it over several months. But raw data wasn’t enough—we needed to communicate this standard in ways communities would understand. "With Tableau, we have a robust platform where we’re offering community teams more engaging visuals and a more powerful analytic tool kit...It’s unlocked the potential to do much more scalable data analytics work, and it's already empowering communities to create more flexible and locally customized tools." 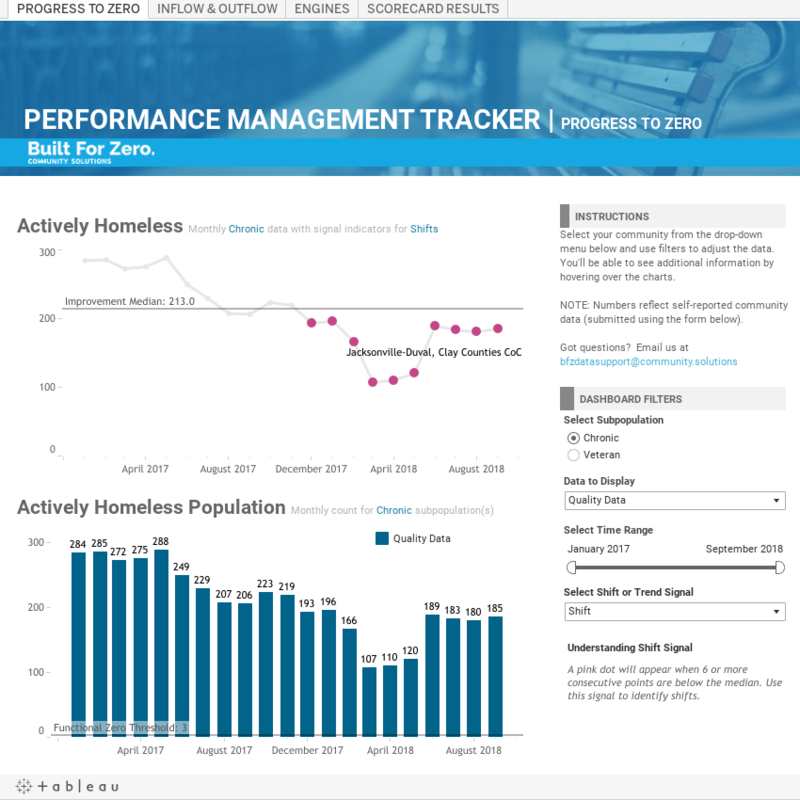 Communities track seven key data points that account for people entering and exiting homelessness every month, analyzing this information in Tableau dashboards. Local leaders use these dashboards to make informed decisions around the distribution of limited housing and case management resources and to track community progress over time. With a clearer picture of the homelessness situation in their communities, leaders can try different approaches designed to drive monthly reductions in their homeless population and measure whether these interventions are actually working. To date, we have 11 proof points of communities who have ended homelessness in one of these target populations and 33 more have made reductions toward these goals. All together, more than 62,065 veterans and 36,770 Americans experiencing chronic homelessness have been housed by participating communities since this movement began. Building these dashboards was truly a team effort. We had help from many Tableau Zen Master volunteers along the way. Ken Flerlage helped our team develop a refined ETL process that was critical to structuring 70-plus community data sets so they could be visualized in Tableau. Lilach Manheim helped us create a style guide for the community dashboards, which saved our team countless hours of work and added a consistent, sophisticated style to these visualizations. With this infrastructure in place, Ann Jackson worked with us to incorporate the quality improvement methods that we coach our communities to implement locally. These redesigned graphics feature visual signaling to show communities how they’re performing against key indicators, making it easier for local leaders to see when they’re meeting their goals and when they need to course-correct. "Believe it or not, most people working in the homelessness sector don’t have a background in data analytics. . .Having access to user-friendly visualizations in Tableau has made it much easier for communities to glean key insights from their data and make better decisions." Built for Zero communities are doing pioneering work to end homelessness, and with Tableau’s tools, they have more knowledge of the situation in their communities and beyond. These local leaders are constantly testing new ideas and tracking their results, creating an improvement engine designed to drive down the number of people experiencing homelessness in their communities. The Community Solutions team will be one of three Tableau Foundation partners showcasing their work in the Expo Hall at TC18. Be sure to stop by and see the visualizations that are helping Build for Zero communities make progress toward ending veteran and chronic homelessness.